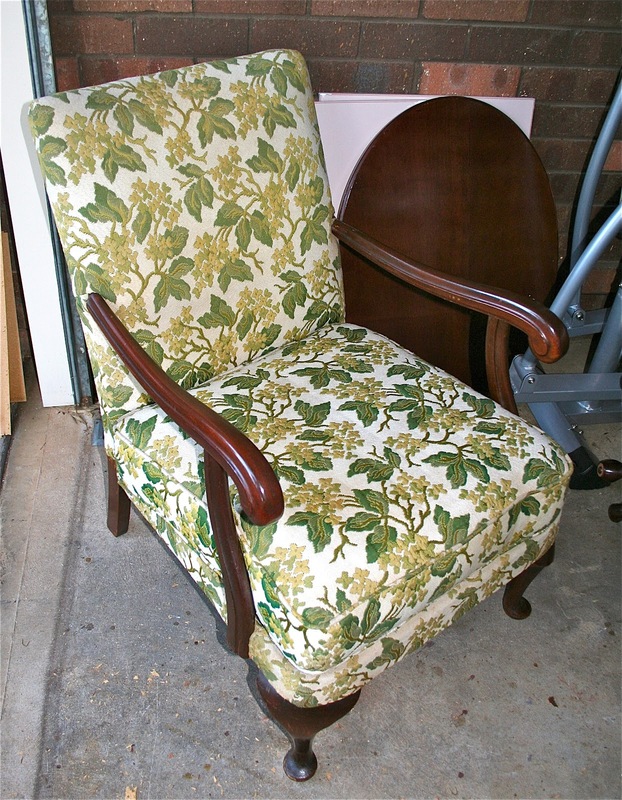 These gorgeous vintage Queen Anne armchairs got a major makeover. 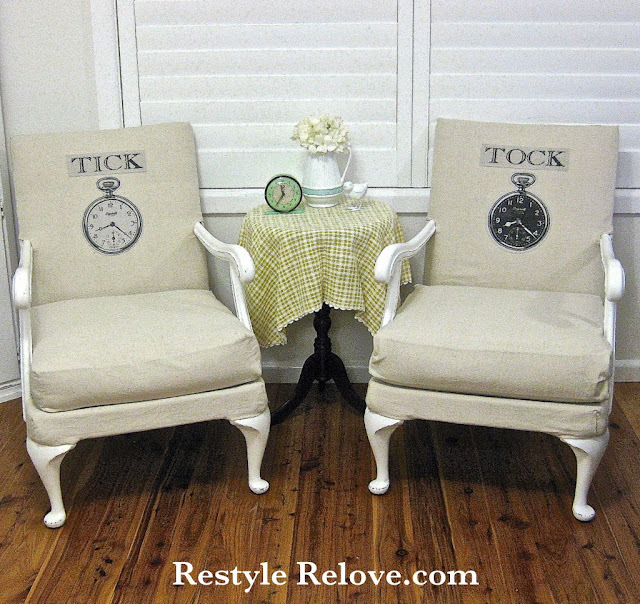 The seats and backrests were reupholstered with beautiful tan coloured canvas drop cloth. New cushions covers in matching drop cloth were sewn with an opening at the back so they can be removed for easy washing. 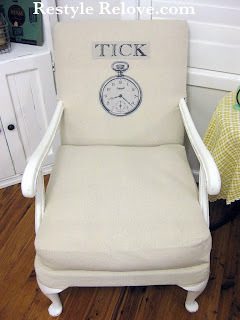 And the woodwork was given 2 coats of white chalk paint, then lightly distressed to bring out the shape and detailing. Pocket Watch graphics (courtesy of The Graphics Fairy) were printed on drop cloth, then sewn around to prevent fraying, then attached to the backs of both chairs securely with fabric glue. 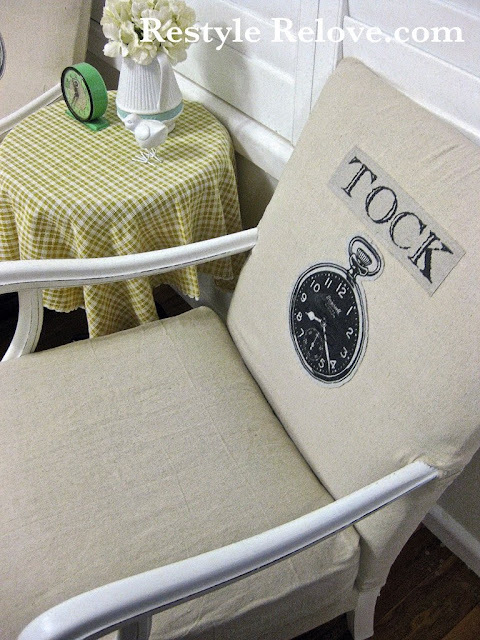 I also created the words "Tick" and "Tock" on my Mac and they were printed and attached in the same manner as the graphics. Notice the pocket watches are inverse colours of each other? Don't you just love that? Finally, the woodwork was given 2 coats of clear furniture wax to seal and protect. It also adds a nice smooth glossy finish. These are FABULOUS!!! Humorous, great graphic appeal, and so creative! Bravo, Bravo!! those are so fun! and what a difference! Julie, these are awesome! I'm so glad I'm following you:) Thanks for sharing on the Not Just a Housewife link party! Too cute! I just pinned this, and I will add you to my Bloglovin roll. I love the tick tock - so clever! Oh I just love this - absolutely love it!!! Really cute idea! Great re-do! 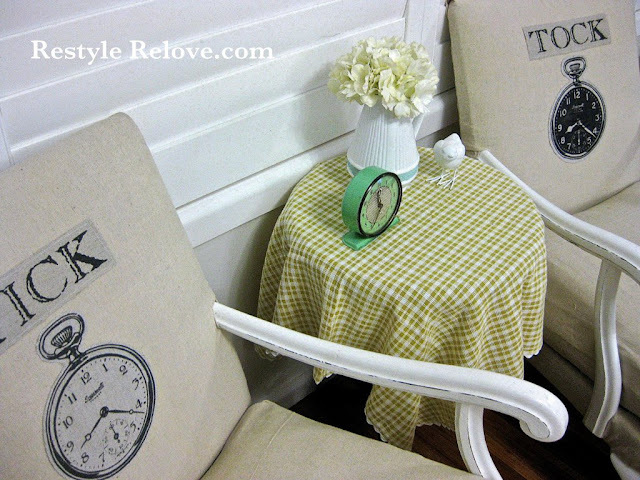 I'd love for you to share this at my linky party, Twirl & Take a Bow at www.houseontheway.com. I think it would make a great addition to the party! Hope you can stop by. Love these chairs Julie. Thank you for linking up at Shabbilicious Friday. So pretty. I love clocks, can't seem to get enough of them so this would fit right in.